While enjoying a typical, romantic Friday evening with a bottle of automatic transmission fluid, a few lit MAP torches and my 1979 Jeep Cherokee Golden Eagle’s owner’s manual, I discovered something amazing: a stain-removal table, which includes information on how to clean various fluids including “vomitus,” blood, “catsup” and urine. 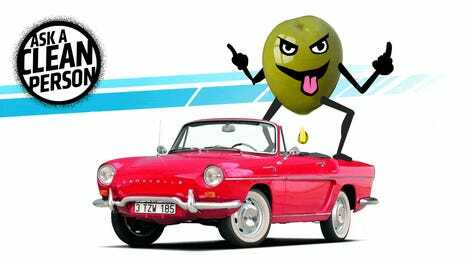 Now, I have no clue what a “vomitus” is, and I’m not sure that my body has ever produced any “catsups,” but one thing I do know is how to clean those mystery fluids off the seat of my 1979 ™Jeep Brand Vehicle. And that’s all thanks to the handy-dandy table below. The table is actually quite comprehensive, including remedies for candy, chewing gum, margarine, shoe polish, tar, lipstick and even mustard stains. “Wipe with cloth soaked in cold water,” the manual recommends for coffee, milk, fruit, liquor, wine, soft drink or ice cream blotches. “If necessary, clean lightly with fabric cleaning fluid,” it suggests. The table recommends a similar remedy for “Catsup” stains, as well as for blood. Other exciting fluid stain remedies include a complex formula for getting rid of urine from fabric. “Sponge stain with lukewarm soap suds from mild neutral soap on clean cloth,” the manual recommends. After rinsing the cleaning cloth with cold water, American Motors Corporation recommends soaking it in a cleaner consisting of “one part household ammonia and five parts water.” Once that saturated cloth has been applied against the stain, and the stain has been rinsed with a wet cloth, the urine should be gone. Cleaning “Vomitus” is a bit easier, with the manual saying folks should just use cloth dipped in cold water to “sponge” the stain, and then use lukewarm water and “mild neutral soap” to lightly wash. If the smell of a drunkard’s late-night chicken wings persists, the manual says a one teaspoon of baking soda per cup of water concoction should take care of it. Ink from a pen, the table shows, may require rubbing alcohol, while bubble gum should be hardened with a piece of ice, then scraped off with a dull knife. Chocolate, which I myself tend to get all over my interior, requires only a cloth and some lukewarm water. So there you go: if you were hoping to urinate, vomit(us? ), kill, catsup, or throw a wine-filled, candy-filled, ice-cream and mustard-themed party in your Jeep CJ or SJ, don’t worry. 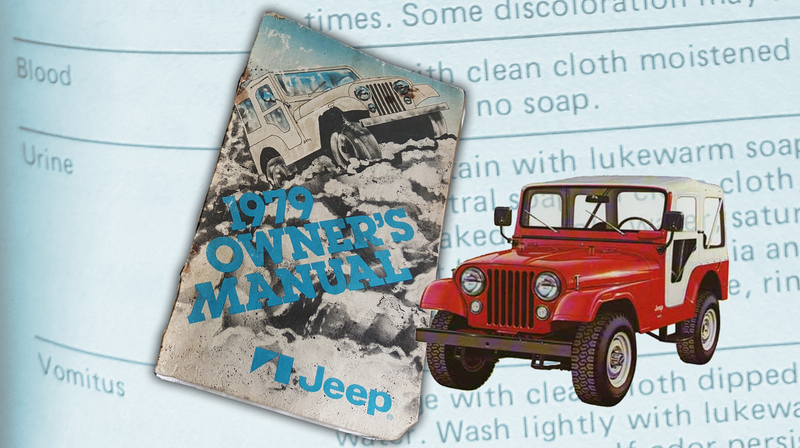 Go right on ahead, because American Motors Corporation is here with the cleaning tips every Jeep™ owner deserves.